We posted a V12 powered BMW 850i last week along with a challenge to our readers to find something V12 powered and cheaper...of course the challenge didn't last long and the tips poured in like fuel into a V12 luxobarge. BMW wasn't the only German manufacturer to offer a ultra high priced V12 tourer; Mercedes-Benz produced its SL600 from 1992 to 2002. 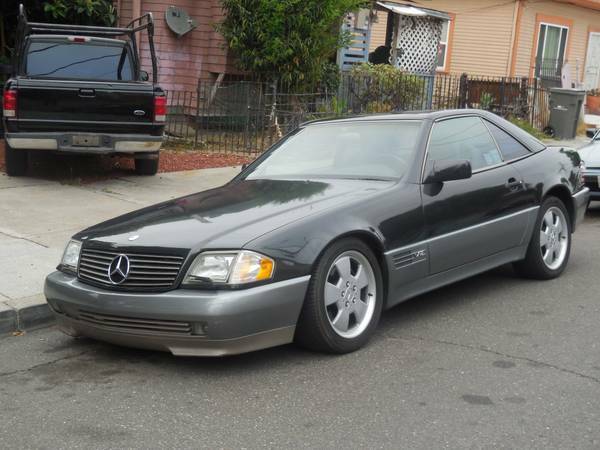 Find this 1994 Mercedes-Benz SL600 V12 for $6000 in Oakland, CA via craiglist. Tip from Kaibeezy. This R129 V12 cost more than $120k USD when new, but now is priced at a day old produce level of $1.34/lb. Its engine is the Mercedes M120, a 6.0 liter 48-valve dual-overhead-cam V12 that puts 389 horsepower into a 4-speed slushbox automatic - a strange combination of high-tech modern engine and old-school burn-out machine style transmission. 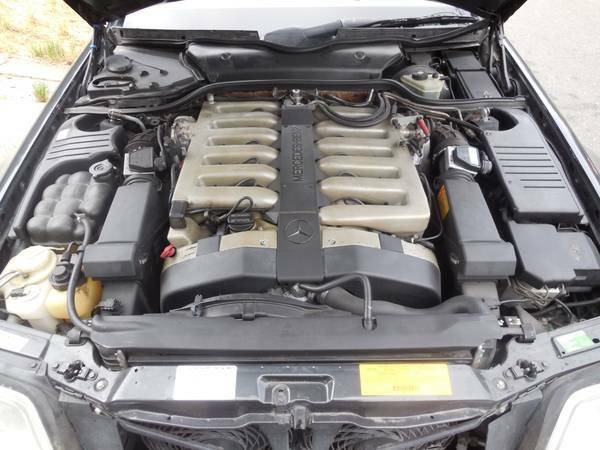 The Mercedes-Benz M120 engine is complex but it was developed back when Mercedes had its eye firmly focused on quality - problems will be expensive, but it isn't like the ticking time bomb under the hood of the BMW 850i...but don't quote us on that...this one could blow up tomorrow. Mercedes V-12. Oakland. Six thousand dollars. "Helllll no." The simple problem here is that the seller lives in a shack in Oakland. Cars like this need to be maintained with an open checkbook policy. I'm not getting that vibe at all. The one to buy belongs to the estate of a Montecito dowager that had it taken to the dealer for monthly waxings. Pay now or pay later, your choice. Thats cheap except @ the gas pump good time to try out some of the people who check out cars that DT has been promoting. Oakland, and no bullet holes? It isn't just the engine that is hellaciously expensive or diabolically difficult to repair. Trust me on this. This car is almost down to LeMons money for a reason. "The one to buy belongs to the estate of a Montecito dowager that had it taken to the dealer for monthly waxings. Pay now or pay later, your choice." Reminds me that my W124 wagon is due for it's monthly scrubbing.